Bracket, an industry leader in Rater Training and Quality Assurance services for Alzheimer’s Disease clinical trials, has presented new data demonstrating that the use of the Bracket Rater Station, a therapeutically designed eCOA solution, can significantly improve data quality by reducing ratings errors. 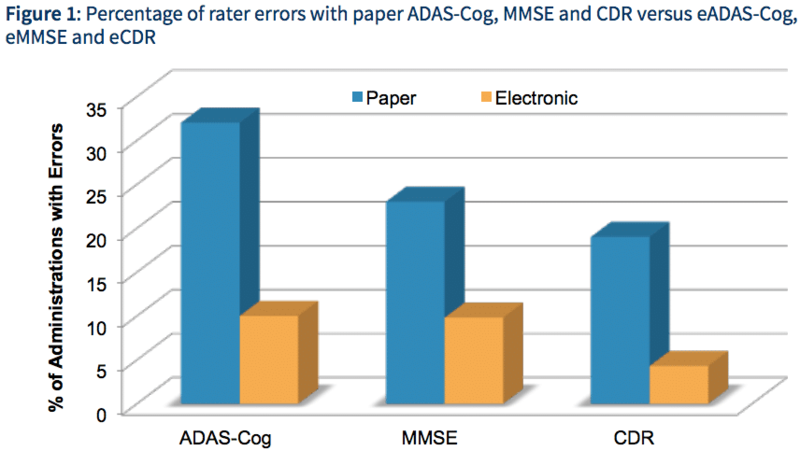 The combination of electronic versions of the ADAS-Cog, MMSE, and CDR, with predictive analytics and related enhancements beyond their respective paper version, improved administration and scoring of the scales and minimized “rater drift” over the course of a trial. “Bracket developed an eCOA solution from these scales based on years of clinical experience in both training and quality assurance programs in dozens of clinical trials. These findings reinforce our belief that issues of ratings variability and noisy data can be minimized through innovative methodologies and cutting-edge technology,” said Dr. David Miller, Bracket’s Therapeutic Area Leader for Alzheimer’s Disease. “We have reported statistically significant reductions in error rates associated our eCOA product. As we continue to implement this proprietary solution in new trials, we can learn more about the opportunities to further improve quality,” continued Dr. Miller. Issues surrounding clinical outcomes variability have always troubled researchers conducting clinical studies in Alzheimer’s disease. Bracket has been a constant innovator in addressing these problems, and is planning additional analysis of ongoing eCOA programs. Bracket eCOA tools have been developed by clinicians, and tested extensively with clinical researchers prior to implementation into clinical trials. The research was presented at the 8th Clinical Trials On Alzheimer’s Disease meeting in Barcelona, Spain, in a poster titled “The Impact of Electronic Administration of the ADAS-Cog, MMSE and CDR-SB on Clinical Trial Data Quality.” A copy of the poster can be found here. Bracket, with seven offices and more than 500 employees worldwide, is a Specialty Services provider dedicated to helping pharmaceutical sponsors and contract research organizations increase the power of their clinical research data by leveraging core competencies in Science, Technology, and Service. Bracket eCOA™ is a flexible platform for electronic Clinical Outcomes Assessments. Bracket RTSM™ is a best-in-breed, scalable and configurable Clinical IRT solution for the life sciences industry. Bracket Rater Training and Quality Assurance improves outcomes through customized training and quality assurance programs.